Coding is nothing more than telling a computer what to do to achieve your creative goal. It’s like making a fabulous cake using a rather stupid robot. You have to assemble all your ingredients and equipment, then tell the Rather Stupid Cake Robot exactly what to do with each thing to make your cake. Here’s a series of short exercises to whistle through the basics of creative coding. They are based on Processing, which you can either use on your desktop, or in a more basic web-based version Processingjs. All the sketches are available via the collaborative coding tool Sketchpad, which uses Processingjs plus a collaborative environment called Etherpad – feel free to clone and fiddle! [You can find an overview of Processing and its variants over here]. Each recipe has a couple of variations to challenge you :). 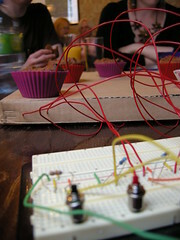 Tagged cakes, learning to code, Processing.